Zoila is using Smore newsletters to spread the word online. The Crust- is where all life resides on the Earth. The Mantle- is where the convection currents of magma in the mantle cause tectonic activity, continental drift, volcanic eruptions, earthquakes, and most of earth's natural land forms. The Core- is made up of solid iron. The rotation of the iron core is what gives the Earth its magnetosphere, the magnetic field that protects us from cosmic radiation allowing life to thrive. Continental drift is the gradual movement of the continents across the Earth's surface through geological time. 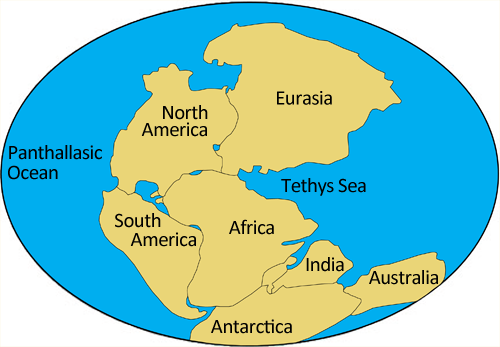 Before continental drift took place millions of years ago, the theory explains that the continents had fit together like a jigsaw puzzle, making one super continent called, Pangea. This explains why we find similar animal and plant fossils on different continents (like the ones found in Africa and South America). This theory was hypothesized by German geologist and meteorologist, Alfred Wegener, who is also known for his achievements in meteorology and is a pioneer of polar research. The sea-floor spreading process was discovered by Henry Hess. What he discovered was that new oceanic crust is created as tectonic plates split apart from each other at a divergent boundary in the ocean and magma from the mantle bubbles to the surface and fills the gap. The magma is then cooled off by seawater and forms new rock that becomes a part of Earth's crust. How Does Sea-Floor Spreading Help Explain Continental Drift? Sea-floor spreading causes the oceanic crust and the lithosphere to continually be created at ocean ridges, and this causes the ocean to expand indefinitely. The expanding of the oceanic crust and the pulling apart of sea floor spreading causes the continents to also pull apart from each other. How Does Convection Move Plates? Heat rising and falling inside the mantle creates convection currents. These convection currents move the plates. The plate tectonic theory states that the Earth's outer layer is made up of 12 plates that have moved throughout Earth's history. The theory explains how and why there are mountains, volcanoes, earthquakes, and other features of the Earth's crust. The theory also claims that about 225 million years ago, all the continents formed one giant super continent called Pangea. The movement of the continents is explained in Alfred Wegener's theory of continental drift, which is cause by convection currents. Transform Boundaries- are where plates slide past each other. This type of movement causes earthquakes like in Irving, TX and fault lines like the San Andreas Fault in California. Divergent Boundaries- are where plates pull apart from each other. This boundary causes earthquakes, volcanoes, rift valleys (like the Icelandic Rift Valley) and oceanic ridges (like the Mid-Atlantic Ridge). Convergent Boundaries- are where plates collide into each other. At these boundaries, mountains are formed like the Rocky Mountains in Colorado. Convergent with Subduction Boundaries- are where one plate sinks beneath the other, usually because that plate is denser. At this type of boundary, trenches like the San Mariana's Trench are formed and lots of volcanic activity happens like the Ring of Fire. 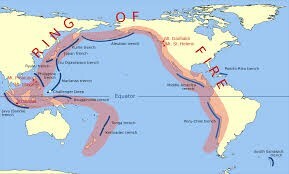 The Ring of Fire is an area where a large number of earthquakes and volcanic eruptions occur in the Pacific Ocean. It is a nearly continuous series of oceanic trenches, volcanic arcs, volcanic belts, and plate movements with a length of about 40,000 km.